By connecting your Social Accounts (Instagram, Facebook, etc.) to The Cirqle, we are able to pull in information like your username, follower count, average likes and comments and demographic information about your followers (ex: country, city, gender, category, age, income, interest, brand affinity). These insights help our brands better understand a creator’s ability to support a particular campaign. Additionally, brands can see your last 30 posts from Instagram to help determine if your creative style and aesthetic align with the brand’s. From your profile, brands are also able to see, your portfolio, featuring work created through The Cirqle for other brands. Connect as many of your active social media platforms as possible. Every campaign is unique and brands activate on various platforms. Therefore by connecting all your social accounts from different platforms, you can apply to more campaigns and will have more chances to be selected. You can connect additional social platforms to your account at any time here. Labels are meant to help categorize the type of content you produce. Any Creator can select 3 categories that help show off their style. These labels are also show on your profile for the brands. You can update your labels at any time here. 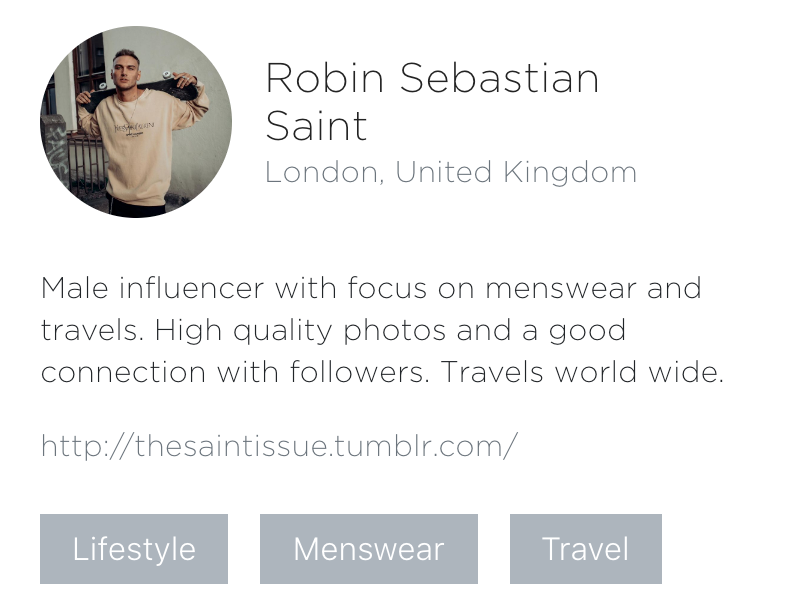 The BIO section on your profile gives us and brands the chance to get to know you and what you love to create and share about. To help get you started, we have selected a few of our favorite Bios that we feel best highlight a creator’s strength for the brands. You can update your bio at any time here. We hope this helps you have a better understanding of how the brands evaluate creators, and that the tips can help improve your chances for being selected!